Joe Marquez, an Instructional Technology TOSA, has been rockin' out Flipgrid for over a year! He is a Flipgrid Certified Educator and Flipgrid Ambassador who continuously shares Flipgrid in his Sons of Technology blog and amazingly energetic conference presentations! 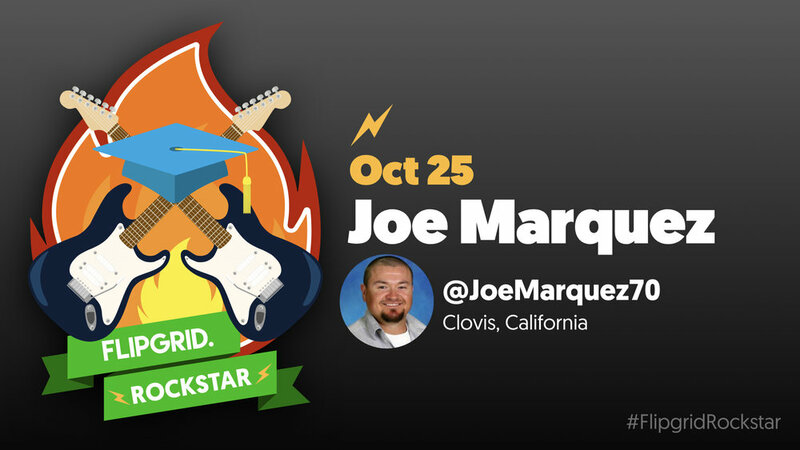 We had the pleasure of having Joe share a multitude of rockstar ideas with the #Flipgridfever community during Flipgrid Unplugged 3: Hacking the Grid. If you ask Joe about Flipgrid, he will exclaim, "Flipgrid is AWESOMESAUCE!" We use Flipgrid on our campus to poll student opinion for digital citizenship and other thought provoking questions. We use it to give a voice to those shy kids who are amazingly smart but do not want to be center of attention. I use Flipgrid as our main video host for our student created screen-casts, green screen videos, and stop motion projects. I also use Flipgrid in a Masters course I teach as our main source of communication and weekly vlogs! Also Flipgrid is my go-to favorite to create an APPSmashing Amalgamation of Awesomeness!! Flipgrid has allowed my students to find their voice and understand that everyone has a statement that deserves to be heard. I would say that EVERYONE is embarrassed to use Flipgrid at first (the students not the teacher). It does not matter what grade level or age. Everyone will try to hide their face or fix their makeup. This phase will pass and Flipgrid will become their new favorite medium to share their unparalleled awesomeness with you!! Joe would love for you to add and participate in his grid TechInClass to discuss the use of technology in the classroom.